Although journalists and bloggers continue to debate the utility, novelty, and ethicality of the new much-buzzed-about start-up Airtime, there's no denying that live video chatting has secured a place in the pantheon of internet fads. Airtime follows the lead of several existing video chat services: Skype, Chatroulette, Apple's FaceTime, Google+ Hangouts, Tinychat, etc. While each of those services offers a slightly different experience (e.g. chatting with one person, multiple people, or a stranger chosen based on similar interests), they all provide an intimate and humanized communication environment for people separated by space. ChatWithTheBand (beta) offers its own unique spin on this phenomenon by allowing musicians to host live video chats and real-time listening parties with fans. Think of it like an in-store appearance - but one where nobody has to know you're not wearing pants (for that, see Chatroulette). None of the artists listed as using ChatWithTheBand on its website were actually hosting a broadcast on Facebook when we checked it out [ed. note: nor were they when we edited this], but we could see how the app worked, which is: fairly simply. After installing it on a Facebook page, an artist can choose to schedule and promote a broadcast through Facebook to get the ball rolling. When the session commences, all participating fans can see and hear the artist on the artist's Facebook page, and can chat about the broadcast in a live text stream. The artist can play tracks (uploaded via SoundCloud), which are available for fans to buy. When the artist feels like chatting, he/she can either click on a particular fan's name to start a video chat with that fan in front of everybody, or click the "Chat With A Fan" button to randomly select a fan to do the same. The rest of the audience can view and comment on the video chat - neat. More features are on their way when this app emerges from beta. Look for Kickstarter and TopSpin integration, email list embedding, broadcast recording, and page customization. Of course, if you're Tom Waits, you may prefer to host your private listening party in a jalopy abandoned on the side of the road. 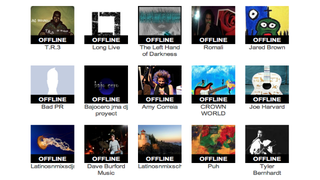 But artists looking for a more reasonable alternative might want to start with ChatWithTheBand. Both emerging and established artists (with active Facebook followings) could benefit from this app, whether to forge relationships with new fans, deepen engagement with existing fans, or give back to long-term fans - without spending an extra cent.